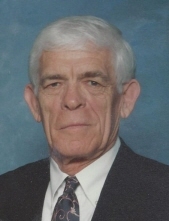 Earl Edward Breazeale, age 89, of Farragut passed away Sunday, March 24, 2019. Earl was born June 11, 1929, in Pruden, Tennessee to Hugh and Virginia Breazeale. He was a graduate of Pruden High School where he played basketball and baseball. He retired from Y-12 and Oak Ridge National Lab after 39 years of employment. He was a member of Robertsville Baptist Church. Earl was a loving and beloved husband, father, grandfather, brother, and uncle. In addition to his parents, he was predeceased by his brother, Hugh Breazeale, Jr.
Earl is survived by his wife of 69 years, Elizabeth; his children and their spouses, Jennifer and David Lay, Melanie and Joe Williams, and Ed and Susan Breazeale; his grandchildren and their spouses, Misty and Trey Harris, Rebecca and Hubbell Williams, Whitney and Matt Stegall, Tyler and Rachel Williams, Alex Breazeale, and Ben Breazeale; 8 great-grandchildren; brothers and spouses, Billy and Bernice Breazeale and Joe and Frances Breazeale; and many nieces and nephews. Our heartfelt gratitude to Rachel Shea and a special thanks to caregivers Lindsey and Stephanie at Amedisys and Donna, Grace, and Diane at FirstLight for their excellent care. According to his wishes, family and friends will assemble for a graveside service at Oak Ridge Memorial Park on Wednesday, March 27, 2019, at noon. Rev. Mike Hensley, nephew, will officiate. In lieu of flowers, donations may be mailed to St. Jude Children’s Research Hospital, PO Box 1000, Dept 142, Memphis, TN 38148-0142 or made online at donors@stjude.org. To send flowers or a remembrance gift to the family of Earl Edward Breazeale, please visit our Tribute Store. "Email Address" would like to share the life celebration of Earl Edward Breazeale. Click on the "link" to go to share a favorite memory or leave a condolence message for the family.